Bed Rail Advantage - SHIPS FREE! 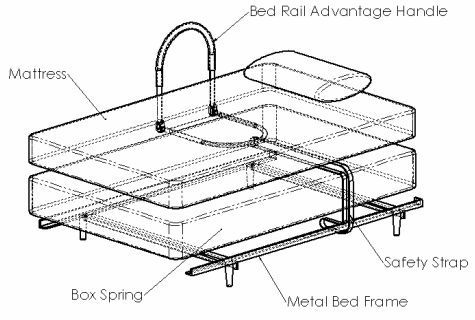 Advantage Bed Assist Rail is constructed with durable, heavy-duty steel tubing. The grip is insulated with a black comfort grip that cleans with ease. 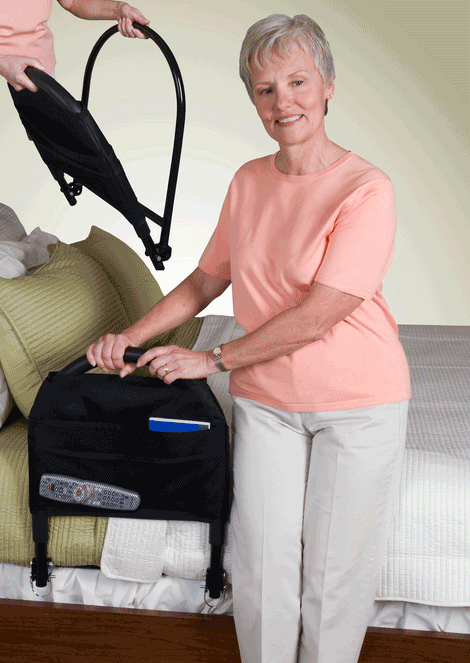 The Advantage Bedrail folds down for storage and portability. 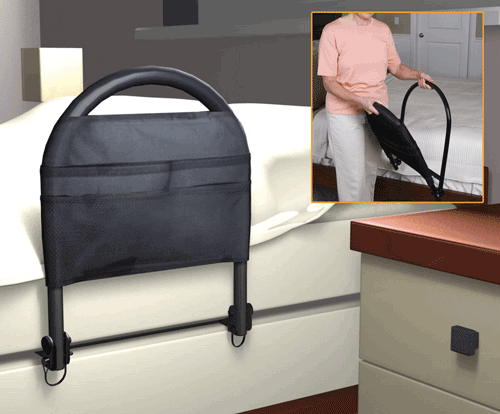 Included with the 5000 Advantage Bed Assist Rail is a safety strap to secure the base to bed frame. 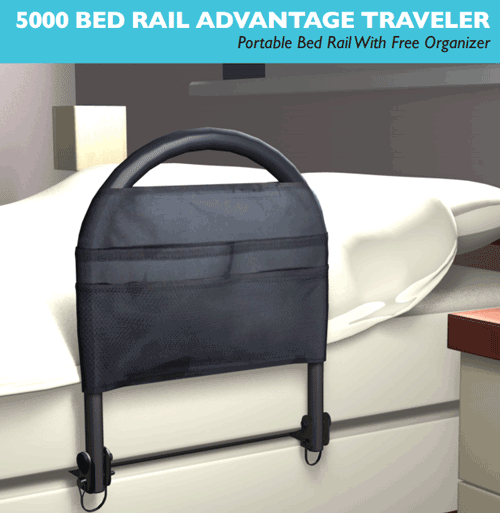 The Advantage Bed Rail is manufactured by Stander and includes a canvas organizer hangover that provides for storage of small items. The Advantage Bed Assist Rail has an adjustable height for varying mattress thickness. No assembly is required for this bed assist rail. Free 4 Pocket Organizer included prevents entrapment and provides storage of handy items. No assembly required. Pops out of the box ready to be placed on any bed. Sanitary Closed Cell foam is easy to sanitize. Quality steel construction heavy duty steel with powder coat finish provides long lasting quality. 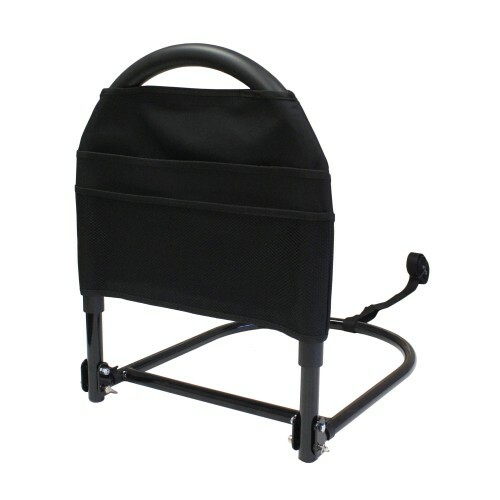 Portable handle folds down for storage and portability. 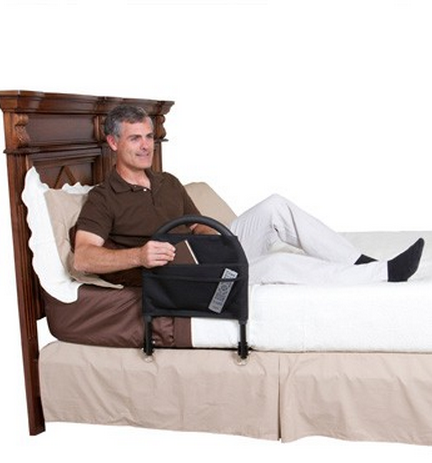 Safe & Secure Safety strap secures base to bed frame and mattress. Comfortable handle foam grip handle. Reversible fits on either side of bed. Reversible and adjustable fits on either side of bed. 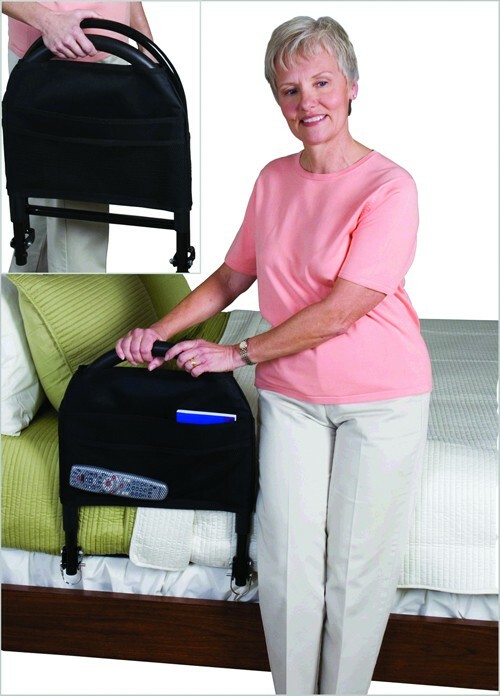 Shipping Dimensions: 23" x 18" x 2"
Bed Compatibility: Attaches to any home or hospital bed with included Safety Strap. The bed rails were exactly what I was looking for. They work fine and are completely easy to use. I am very satisfied. My 93 year old mother broke her left femur and had surgery. When she returned home she needed bed rails to use as support when getting up from bed, getting into bed and to hold onto when turning over in bed. This product works very well and I am so glad I purchased it. Great product. Easy to use to get out of bed. This Bed Rail provided great comfort! My husband bought me this after I gave birth through Cesarean Section. It really made things comfortable and easy for me to get up even without anyone's help. After using it for quite some time I just kept it, who knows there might be someone who will need it in the future! Do you have habit of rolling out of bed subconsciously? Do you also require side bed storage to keep your bedtime essentials? If so, then Standers Bed Rails is the answer to your problem. I have bought this for my grandmother and she loves it. It prevents her from falling as she is losing her balance with time. And above all, it weighs less than 81bs and has a cushion padding that is soft and easy to clean. Thanks to Stander bed rails. Everything you need within your reach! Last month I had back fracture so my mom bought it for me. I couldn’t get out of bed for weeks and it meant I had to do most of the things in bed. 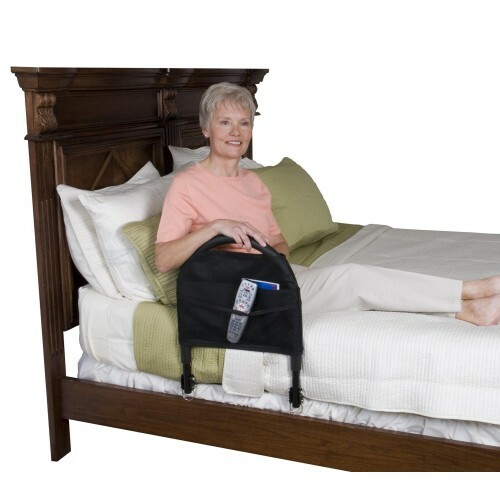 This product helped me so much because you can put things you need around the bed like remote, books, and medication in it and it can always be within your reach. So you don’t have to bother others to make them get things for you.